Finally cracked the spine on Hawkworld #1 a couple of days ago, and finished the series last night. I had intended to read #2 to my infant daughter while my wife put the other kids to bed (at her age, simply reading is fine, doesn't matter what the material is... no, really...). I ended up essentially tearing through #2 and then #3 in short order. So, needless to say, I enjoyed this series quite a bit. I have had some contact with a fellow (but admittedly much more prolific, talented, and respected) podcaster about doing a show about Hawkworld, so once I have more information on that I will communicate it here. As such I don't want to get into my thoughts too much in this space, but I will share a couple notes. First off, while I knew that this series was where the utopian Thanagar was jettisoned for the dystopian "modern" version, I was not privy to the details of the story, only some broad strokes (namely, Byth's presence). So the twists and turns in the story were fresh to me, and I very much enjoyed being surprised by them. I liked how Tim Truman included some subtle aspects of the original Katar Hol in the personality of the new one, but made him a more complex and involved character. I mean, I'm a huge fan of the Silver Age Katar, but he's, by design, a straightforward kind of guy. This version has a lot more facets. I also really appreciated the themes of dichotomy and duality, which is common in science fiction comics but very well executed in this series. Like it says on the back cover: As Above, So Below. Truman's art is a great fit, especially on the nice paper of the square bound, prestige format books. I get a strong 2000 AD vibe from his work, which I suspect may be a combination of the subject matter and the muted colors. But considering said subject matter, the art fits very nicely and I think the overall presentation is helped out tremendously by having Truman handle the visuals as well as the words. 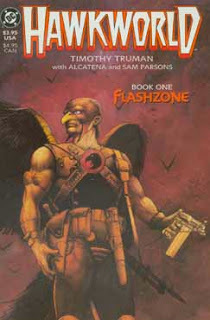 Image: Hawkworld #1, Tim Truman, 1989, image obtained from Mike's Amazing World Of DC Comics.